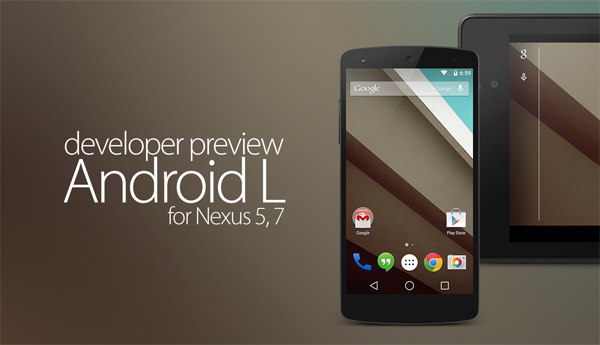 At yesterday’s Google I/O keynote speech, Google unveiled Android L, its new and significantly advanced version of the mobile software. Complete with a more layered approach benefiting from the company’s “Material Design” initiative, it looks more fluid and immersive than it ever has, and while we were impressed by the demos, we also couldn’t wait to try it out for ourselves. The Big G promised that a preview SDK of Android L was imminent, and today, those in ownership of the Nexus 5 smartphone or Nexus 7 (2013) tablet can dive right in. It’s worth pointing out that the factory images of the Android L preview will only work for the Wi-Fi model of the Nexus 7, but given their availability through the Android Developer portal, those familiar with the process will be able to download and get flashing! This is only a preview build of Android, and as such, will be laden with bugs and imperfections. Those familiar with flashing firmware and tinkering with the innards of the Google software should have no qualms with installing the preview on a spare device, but if you’re only a beginner or considering installing this system image on your daily driver, we’d like to discourage you from attempting this. 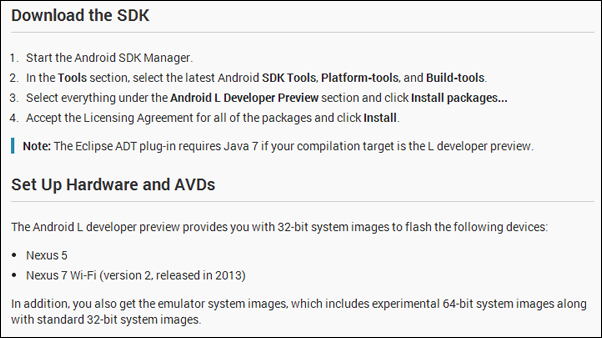 It’s easy to get carried away amid the excitement and jump straight on the preview SDK for Android L, but it’s labeled as a preview for a reason, and with the end user OTA not slated until the fall, it’s still months away from being deemed ready for prime time. We haven’t had a chance to test it out for ourselves just yet, but although some features are known to be functioning – including a number of third-party apps – it’s definitely well short of being the finished article. The rationale behind Google announcing Android L yesterday and following up with the preview today, is to allow developers a chance early on to see what’s next from the Android software. In the run-up to I/O, Android, Chrome and Apps lead Sundar Pichai noted that the company wanted to be more transparent with regards to future releases, and as such, don’t be surprised if Android gets a regular slot at I/O in years to come. Anyway, if you wish to get started, the downloads are linked below and detailed instructions for installing / flashing can be found here.